When Star Trek II: The Wrath of Khan (WOK) opened on screens in June of 1982, something was instantly obvious – this new Star Trek didn't look like anyhting that had come before it. The film begins with a close-up of Spock who is wearing, well, something new – a vivid maroon uniform with a white turtleneck. As the camera pulls out we see that the entire bridge crew is wearing new uniforms. 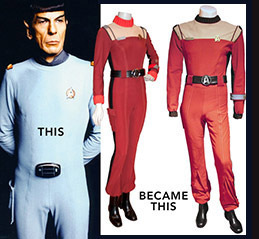 While some looked like Spock's, others wore a maroon jumpsuit of some type. This was something very bold, very different – and I fell in love at first sight. That was my introduction to the new Starfleet style first introduced in WOK. It was a total departure from not just the bright gold, red and blue uniforms of the Original Series (TOS), but from the drab grays and tans of the first Trek film as well. As the movie unfolded we saw even more – Dr. McCoy's Sickbay was flush with new whites combined with moss green turtlenecks. Security officers wore deep maroon with dark green shirts. Engineering had the Radiation suits introduced in the previous film with some new adjustments. There was even a new maroon Field Jacket that crewmembers would wear when going off-ship as well as a maroon vest worn by Admiral Kirk. Later films would give us even more uniform variations. Costume designer Robert Fletcher was the costumer for Star Trek: The Motion Picture (TMP). He was asked to come back for WOK, but with a new mandate from director Nick Meyer: everything from TMP had to go. Meyer hated the look of the previous film and wanted to set course with a new approach to just about everything, not the least of which was the costuming. To that end, Fletcher created the so called "monster maroon", the maroon-jacketed officer's uniform that Kirk and his officers would now wear. 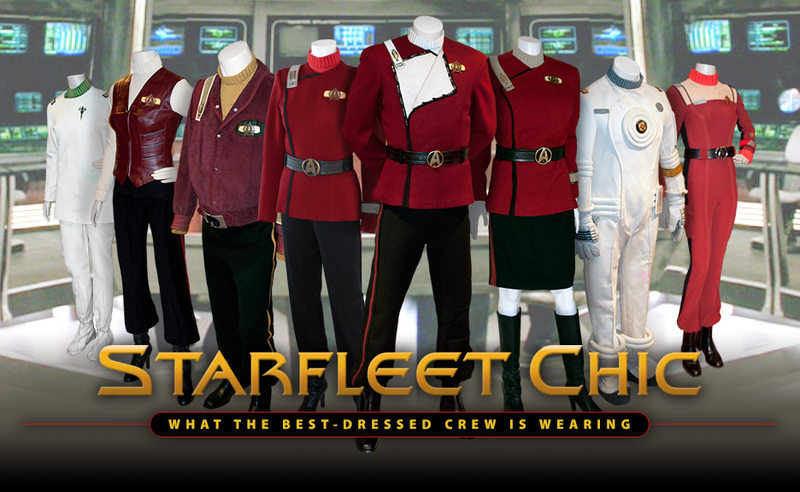 The new look was much more military in style, and was intentionally designed to emulate nautical, swashbuckling uniforms of the nineteenth century, but with a futuristic flair featuring details like department colors, a Starfleet badge, rank and service pins and more. The result made for a totally new look for the twenty-third century. But there was a fundamental problem. WOK had a very restricted budget, leaving Fletcher only enough money to create the new costumes for the main cast, but not for the rest of the crew. As luck would have it, however, there was an elegant solution. Fletcher took the tons of jumpsuits and two-piece uniforms he had ceated for TMP and totally redesigned them, changing out all the details and, most significantly, dying the pieces maroon to go along with the new maroon officer's uniforms. It was still a lot of work, but Fletcher was way ahead of the game, cost-wise, by modifying old costumes rather than creating all new ones from scratch. The two-piece Class-A uniforms from TMP became the Security Officer's uniform. The various white and tan TMP jumpsuits worn all over the ship were altered to become the new Enlisted Crewmen's uniforms, while the white TMP Sickbay scrubs simply had turtlenecks added. 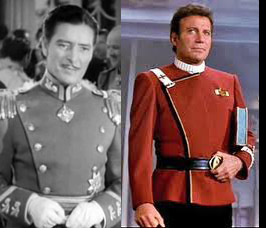 When all was said and done, there was no indication that the uniforms from TMP were reused in any way, such was the sly nature of Fletcher's designs. Check out the above links for more details on all of the different styles.